Janet Meier Designs has more offerings than you might imagine. To get an idea of the scope of our company, please read about us below. We are a full service interior design business specializing in home décor, furnishings and window coverings, offering design services for residential and commercial. Our goal is to help our customers create the space that suits their needs, tastes, and budgets. We offer a wonderful selection of furniture to special order, and we try to keep a good stock of upholstery and accent furniture on our floor. In our store you'll find a selection of dining room, bedroom, upholstery of all types and accent pieces. We also carry a large selection of wall décor, lamps, mirrors and accessories. If you're in need of window coverings, we offer all styles - drapery, blinds, woven shades and shutters. 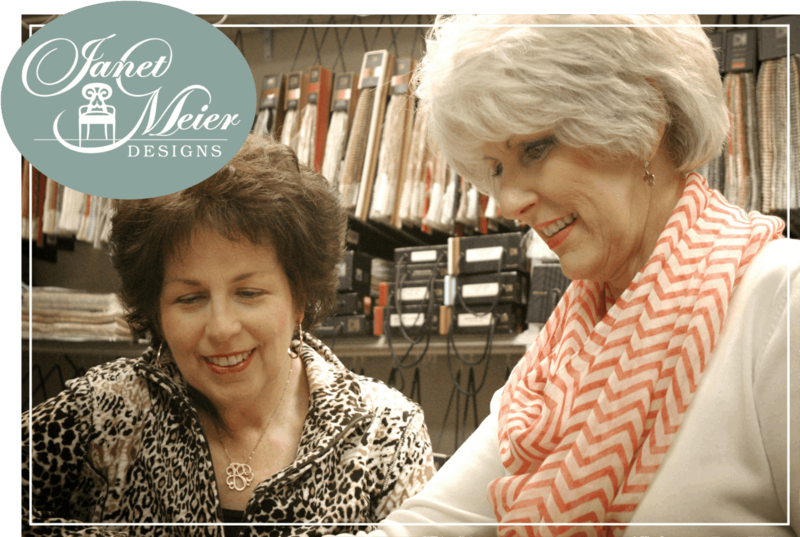 At Janet Meier Designs, we are not high end but strive very hard to achieve a great look for a very affordable price. Those who give us a visit are always pleasantly surprised when they turn over the price tags! In 2015, we are proud to say we were selected one of the top three designers in the Northwest Louisiana area. Call us today or come by the store. We would enjoy getting to know you, your personality, and what would make a house your home. It is truly our goal to create a place you want to come home to!